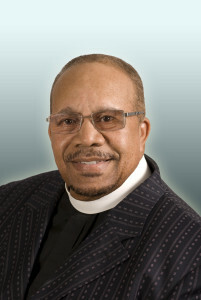 Bishop Lewis E. Evans is the son of the late Bishop O.A. Evans, pastor emeritus of the Indiana St. Church of God In Christ where he pastored for over 50 years, and the late Mother Oxolla Evans, a praying, Godly woman. He attended the University of Detroit and received a Bachelor of Religious Education from Detroit Bible College ( William Tyndale) in 1977. In 1987, he received a Masters of Arts degree in Biblical Counseling from California Graduate School of Theology, Anaheim, California, and in 1991, a Master of Arts degree in Pastoral Studies from Ashland Theological Seminary, Ashland Ohio. He engaged in doctoral studies, beginning in 1988 at California Graduate School of Theology, and later at Faith Evangelistic Theological Seminary. He was conferred with the degree of Doctor of Theology from the former Faith Evangelistic Theological Seminary on May 14, 1994. Bishop Evans places great value on the call of God, the anointing of the Holy Spirit and educational preparation for the work of the ministry. Called to preach at only four years old, Bishop accepted Christ and was filled with the Holy Spirit as a pre-teen, and pursued his childhood calling as a preacher at age 17. Bishop accepted his first pastorate at age 34, at Mt. Pleasant Baptist Church in Fremont Ohio. He later pastored the Jehovah Baptist Church for 14 years, where he met and married his wife, Pastor Lynda, who serves with him in ministry. He is also the proud father of two daughters, who have in turn blessed him with eight grandchildren, and four great-grands. Both daughters also work in the ministry. The oldest, Brenda, serves as an Associate Pastor. Bishop Evans is Sr. Pastor of Soul Harvest Ministries, an interdenominational, church, which he founded by the Holy Ghost in May 1994; and Presiding Prelate of the Soul-winners Evangelism And Disciple-makers Interdenominational Fellowship (SEAD), which was organized in 1996. Bishop Evans is a highly anointed leader with a vision for God’s people and a bold stance for the Lord. He has an unparalleled passion for the lost, and he is one of the greatest teachers of the Word in the body of Christ. Bishop, a Pastor of Pastors, is academically prepared, spiritually attuned, intellectually astute, mentally elevated, equally yoked, faith empowered, eagle-eyed, enemy lethal, ever-ready to meet the challenges of ministry in this century.